I often take animal portraits at my local zoo. For photographers, zoos provide a consistent way to get close to a variety of animals without the time and expense of travel to exotic locations. Here are some tips I have learned from several years practicing zoo photography. 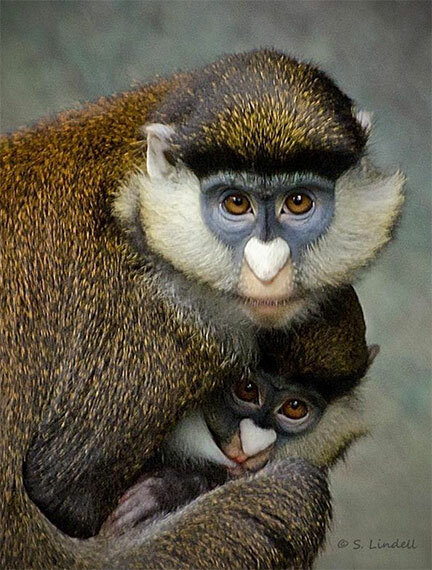 Primates are often a wonderful source for expressive portraits. The gear I consistently bring with me on every visit to the zoo with my DSLR camera is my 300mm zoom lens and my 50mm prime lens. During the colder, dramatically less crowded months (I live in Chicago) I occasionally bring my tripod; however, I found a beanbag that attaches to my camera to be easier to use in cramped conditions. I can squish the beanbag against railings or fencing for a firm, steady support. A lens cloth is also indispensable. A spare battery is good insurance. My camera model holds two SD cards, which I find are plenty for my time there. As you discover your favorite animals and style for shooting you will learn what specific items work best for you. If you’re planning to photograph smaller critters such as small reptiles or if the exhibit has a glass viewing area you may also want to bring some sort of shield for your lens. There are rubber shields that fit like a filter on the end of your lens which will allow you to put it up against the glass to eliminate reflections. A rubber shield on my 50mm prime lens allowed me to get up close and personal to this tortoise and avoided reflections on the glass. Don’t forget that the shield will cause you to lose a bit of light; you may need to adjust your exposure to accommodate. Pay attention to your light direction and try to move to give the best exposure for your subject(s). I tend to spend much of my time at the lowland gorilla exhibit at my local zoo. This particular area allows viewing 360 degrees around the enclosure. I now understand on which side of the exhibit to position myself to allow the best exposure due to the light direction. Even if the gorillas are active on the opposite side, I have learned it is better for me to wait for them to move to my side rather than be disappointed with un-editable shadowing due to poorly lit, dark animals. I need to use a very low aperture with available light, since most indoor exhibits prohibit using flash. The low aperture will also help minimize backgrounds. I use the fastest shutter and a high ISO to freeze the action. I will also shoot in RAW. The larger file allows me to crop to a smaller portion of the picture and still be acceptable. Watch the animal’s eyes and be ready to hit your shutter quickly to have eye contact with your viewer! More often than not the animals will simply scan over the visitor viewing area occasionally rather than stare at any individual person. For clear shots maintain a fast shutter with burst mode and be ready for that split second when your subject looks toward you. When you see its eyes start sweeping your way, start shooting! A long lens will give you the ability to see when an animal’s eyes appear to be staring right into your camera. Be prepared to wait quite a while before picture worthy behaviors occur. Just as in the wild you will need patience and a bit of extrapolation to catch the action or expression of a nice shot. Please be considerate, however, and do not hog a large area of prime viewing space. Keep elbows in and tripods close. Stand firm while waiting, as you may be jostled on crowded days. Most people appreciate a little thoughtfulness. If I’m at a window viewing area with my long lens propped against the glass, there’s enough room to allow a shorter child or two to stand in front of me without disturbing my camera position. Sometimes my camera will actually attract other people to come see what I’m photographing, but I have noticed most zoo visitors only spend a few minutes at any given exhibit before moving on. When I arrived at this snow leopards area, he was sleeping. I waited for him to wake up and as he yawned I was able to capture what appears to be a fierce expression. If you move into a different temperature environment take care to protect your camera and lens from condensation. Going from cold outside air to a warm building housing tropical climates will cause your lens to fog. I like to keep a lens cap in place for at least five minutes after entering to allow the camera time to warm up. I keep a lens pen and a lens cloth handy, as well. If the outside air is bitterly cold, I tuck my camera into my coat as I walk to the tropical buildings to help keep it warm and reduce condensation. Try to get to know zoo personnel and other regular photographers as they may be generous with inside information about best times for photographing specific animals. I have discovered a whole little sub-culture of regular zoo photographers who are friendly resources of information, anything from advice for camera settings to gossip about the zoo animals. When editing your images, don’t be afraid to crop close to reduce or eliminate fencing, zoo visitors, or other distracting factors. I often choose to convert the image to black and white to avoid distracting colors from things like painted zoo enclosure backgrounds. If your favorite animals are napping or not on display, you might want to try getting shots of zookeepers or volunteers as they do their jobs in the zoo. If you’re a regular visitor, you may want to consider getting small inexpensive prints of your best shots and giving them to the respective zoo personnel next time you see them. Sue Lindell is an amateur photographer who credits joining a local camera club for learning how to practice with a purpose and discovering her passion for photography. Further examples of her work can be found at www.lindellimagery.com. I remember an article some time ago about removing the “bars” or “wires” in photos of animals in cages. I cannot remember when you published it and unfortunately did not bookmark the article. Could you possibly give me a url for that article? This is a fascinating and useful article – thank you for publishing it. The article does throw up a number of questions around intellectual property and use permissions for pictures taken within zoo premises. I would be interested in learning more about these matters as I regularly take photographs of creatures in my local zoo. Could you suggest any useful resources on this subject?